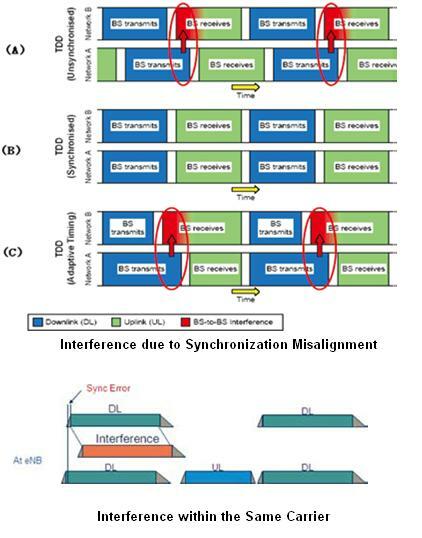 Interference between Different Carriers and within same carrier in LTE, delay spread in the radio channel, multi path delay spread, cyclic prefix, tdd system. Absence of synchronization is one of the main sources of interference between TDD based systems belonging to different carriers. The figure below provides a quick view of what will happen if there is asynchronous situation between different networks. Scenarios (a) and (c) described below clearly indicate inter-carrier interference. Implementation of time synchronization equipment such as IEEE 1588v2 will help to resolve most of the asynchronous systems problem. Even within the same network, difference in propagation delay will create time of arrival variation at the eNodeB and will result in intra-system interference as shown upper. To resolve this problem in LTE TDD system, a longer guard band period can be selected between DwPTS and UpPTS. For FDD system, the delay in propagation can be resolved by using a smaller Cyclic Prefix of 6 (Extended CP) instead of 7 (Normal CP). The CP is a copy of the end of a symbol inserted at the beginning. If this guard period is longer than the delay spread in the radio channel, the inter-symbol interference can be completely eliminated if each OFDM symbol is cyclically extended into the guard period (by copying the end of the symbol to the start to create the cyclic prefix). By sampling the received signal at the optimum time, the receiver can remove the time domain interference between adjacent symbols caused by multi-path delay spread in the radio channel. 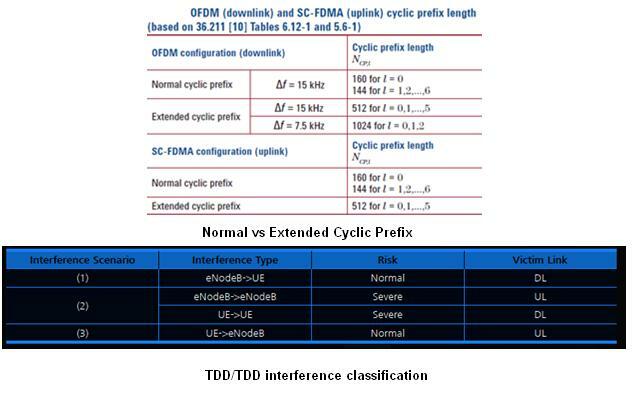 Cyclic prefix lengths for the downlink and the uplink are shown in the figure below. In the downlink case, Δf represents the 15 kHz or 7.5 kHz subcarrier spacing. The normal cyclic prefix of 144 x Ts protects against multi-path delay spread of up to 1.4 km. The longest cyclic prefix provides protection for delay spreads of up to 10 km. 26 queries in 0.351 seconds.